THANK YOU! Last 2-years, through Booster.Com, we raised over $1800 for Courage Kenny Rehabilitation Institute JUST through our t-shirt sales!! And this year we aim to surpass that amount. In order to do that, we have partnered the A La Cart Creative Group to bring you the best in WTC gear. Beginning with our new ballcap and SiliPints. And that is just the beginning!! Stay tuned as we continue to add to our collection! And a percentage of your purchase may be tax deductible* as proceeds will be used for more programs so that patients and caregivers can find connections with one another as well as with needed medical resources, and counseling services. So, go ahead...purchase some WTC gear and Be the Connection! SiliPints are silicone "glasses" perfect for your outdoor summer activities. Featuring the new WTC logo in navy and gray on a frosted silicone pint. Freeze it for that frosty mug of beer or any cold beverage. Dishwasher safe and durable. $15 with $7.50 going towards "Connect" efforts. Ballcaps are by SportsMan, a leader in cotton twill ballcaps. Low profile, relaxed fit with brass buckle for a perfect fit. Gray cotton twill with the green, navy and dark gray WTC logo on front with "WalkTalkConnect" in navy across the back. Comfy and stylish...perfect for any activity! $30 with $12.00 going towards "Connect MPLS" efforts. Tees enjoy a District Made t-shirt with the softness of 100% cotton. 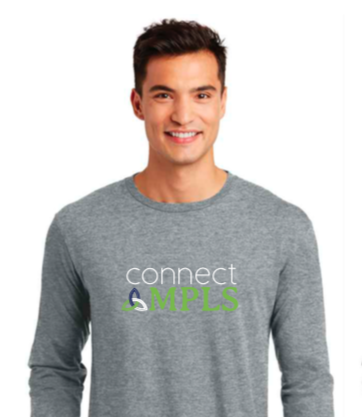 Each t-shirt features our NEW logo and we have two designs that also feature our rally cry, “Connect MPLS”. Being rooted in Minneapolis, we aim to build a community of brain & spinal cord tumor patients and families right here on our home turf. We will be expanding to other cities to help build a community of connections across the country. So funds raised from our merchandise sales will go towards this effort. Each t-shirt is $25 with $10.00 going to “Connect” efforts.